The beaker is moulded with sea gods at play. Traces of arsenic in the glass make it appear to change colour like a precious opal. Glassmaking was allied to alchemy at baroque courts. This glass was made on the estate of Count Buquoy in Bohemia and was perhaps designed to be set into silver-gilt mounts for use as a welcome cup (Wilkomm). Cylindrical beaker and cover of opal glass; blown in a mould to represent a triumph of Neptune; on cover: three dolphins radiate from knob. Provenance: Baron Anselm von Rothschild, Vienna, by 1866 (cat no. 21), by inheritance to his son Baron Ferdinand Rothschild (d. 1898). Seven examples of similar glasses presumably produced in the same workshop are identified in Walter Holzhausen, 'Sächsische Gläser des Barock', in Zeitschrift für Kunstwissenschaft, Band VIII, Heft 1-2, 1954, pp. 105-107. To these can be added a clear example, badly crizzled, which was acquired by the Kunstindustrimuseet in Copenhagen on the Berlin art market in 1909, inv. no. A 53/1909; an opal beaker without cover in the Pena Palace, Sintra; and an opal beaker with bun feet in the National Museum in Cracow. Another crizzled example with a cover was sold from the Mühleib Collection at Bonham's, London, 2 May 2013, lot 11. 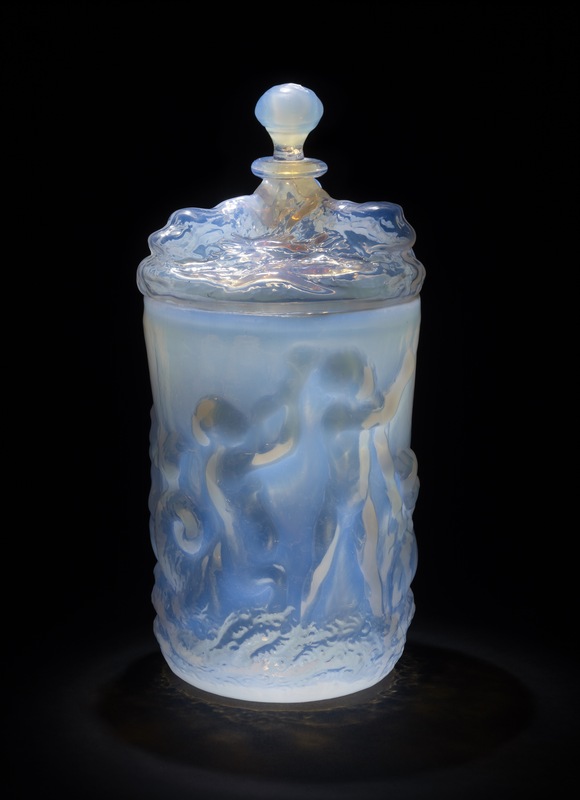 Another opal glass beaker of this design with its lid, like the Waddesdon Bequest example, is in the Gotha Museum, inv. no. Pn 41. The British Museum has a second example without cover made of girasol glass, which changes colour from pearly cream to red lustre in a slightly different tone, but with extremely similar chemical composition, inv. no. 1873,0329.38. David Whitehouse, 'Glass, A Short History', British Museum, London, 2012, p.68 & illus. Dora Thornton, 'A Rothschild Renaissance: Treasures from the Waddesdon Bequest', British Museum, London, 2015, pp.138-141.